One role that philosophers play is we take ways of thinking and we amplify them, codify them, play with them, tweak them, and follow them to their (often absurd) conclusions. One of my grad school professors used to joke that he would tell people that he was a "conceptual engineer" by trade so that people (or at least the women he was trying to pick up) would take him more seriously. It wasn't really a lie: that's part of what we do. We tinker with ways of thinking in order to try to improve them. This is one reason why philosophers always behave so strangely. It's because by long practice we have learned a habit of disassociating ourselves from our thoughts. The more native and natural way to think of ideas is that they are personal--you yourself have them. Common sense talks about our opinions and reasons as if they are our own, and we get emotionally attached to our ideas. An attack on our way of thinking is an attack on us. Philosophers, though, see opinions and modes of thinking the way that engineers see bridges and roads. They don't see them as the possessions of a single person or reflective of a personality with a set of commitments. They tend to see thoughts and ideas as objects constructed by communities for certain purposes. Like engineers, they want to tinker with them, to make them serve their purposes better, and they tend to develop a sort of engineer's distance from the objects of their analysis. Philosophers are just like engineers, except less optimistic. Philosophers are trained to be this way, but we are probably drawn to philosophy because of some sort of natural proclivity to treat thinking in this manner. One of the downsides of this sort of technical view of the nature of philosophy is that after a while, for philosophers, almost all thinking gets abstract and distant. We become like engineers or architects who are fascinated by the structure of bridges, their beauty, their mathematical form, etc., but who perhaps forget that the purpose of a bridge is not to be intellectually pleasing or perfect or precise, but to get people across the river. Philosophy can sort of mess up your mind because the habit of philosophizing makes us turn our minds towards analyzing its own structures. This is fine, except that the mind, like a bridge, is not best understood on its own terms, but in terms of its actual function in practical conditions. The common sense way of thinking about thoughts has some truth to it. Our thoughts are personal. They influence the way we interact with the world. It would be strange not to become attached to them because they are important--really important--to us. When philosophers forget the personal nature of thought, we tend to get caught up in a particular "ism." We forget the vital common sense questions that drove us to philosophy: how to think better, how to live more fully, how to experience more deeply, how to think more truly and honestly, etc. In their place, we begin slowly to substitute specialized philosophical questions like: how is this "ism" better than that "ism"? What would this "ism" say about this particular subject? Is this part of this "ism" logically consistent with this other part of the "ism"? It happens to most every philosopher. My "ism" is pragmatism. I bring this up because this problem is, of course, not unique to philosophers. All of us are forced to specialize in one way or another. 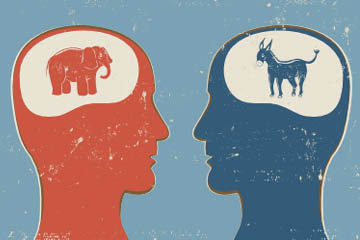 We rely on patterns of thought, shorthand labels, political parties, etc. This is not out of laziness; doing this is actually a sign of intelligence. The world taken without shortcuts would be simply an unintelligible blooming buzz of sensation. Think, for example, of the experience of a newborn baby. This baby is unable to discern the patterns of pretty much anything; it can't selectively attend to its environment, and pick things out. The same thing happens to us when we play a new game or have a totally new experience. Everyone else seems to understand what's going on, but to us the world seems to be flying around chaotically. Being able to play the game means being able to recognize patterns and repeat them or anticipate them. In other words, thinking requires using shortcuts that allow us to ignore certain aspects of experience and concentrate on others. In life, through time, we settle on the shortcuts that work work for us. We adopt a number of "isms" that become precious to us because they help us sort out the world. We begin to cherish them, and in certain cases even worship and fetishize them. In my view, this is the truest way to understand religious life. Christianity, Buddhism, Islam, Judaism etc., all provide ways of shortcutting experience, by turning us toward this sort of thing instead of that, emphasizing a certain arrangement of concepts over another. Politicians understand this all too well. They know that winning a vote is more about selling a certain framework of concepts that make the world appear in a certain way than it is about winning an argument. Democrats' favorite concepts are race, poverty, equality, society, justice, and fairness. Republicans prefer concepts like competition, the market, personal responsibility, and the economy. Once you buy that framework, you learn to attend to certain things and ignore other things, and over time your habits of attending to experience inform the way you see things, perhaps so much so that those who do not share your point of view seem totally alien to you, as if they are living in another world. Which, in some ways, they actually are, if your world is merely the sum of your experiences. Habit is two-sided. Without its ability to concentrate and narrow experience to its most important elements, we would be totally lost. On the other hand, if we get too stuck in our habits, we run the risk of shutting ourselves off from renewing experiences. Habit can be a great friend; at its best it is determination, consistency, and fidelity. When it turns bad, we call it addiction, dogmatism, close-mindedness, and xenophobia. Philosophy is the habit of constantly re-evaluating our habits of thinking. This habit can be taken too far; it can lead to paralysis, confusion, over-analysis and lack of commitment. But when it is measured and appropriately applied, it is perhaps the most important habit that we have. How do we find the appropriate measure of philosophy? How do we know when we are thinking too little or too much? I am not sure that these questions can be answered once and for all. Different temperaments will be comfortable with different doses of reflection, and different historical moments will be better suited to reflection on our fundamental habits of living. Socrates reminded us two thousand years ago that we know that we don't know. For all the changes that we have undergone since Socrates was hanging around, it strikes me that this is still true. Language, culture, and simply our ways of living organize our experience in ways that make inquiry into the limits and possibility of experience difficult. To be philosophical is to take that difficulty seriously--but not too seriously--because after all our seriousness itself might be the very habit that prevents genuine critical reflection. This is probably the most concise and comprehensible explanation of philosophy I've read. Just as an aside...You write, "When philosophers forget the personal nature of thought, we tend to get caught up in a particular "ism." We forget the vital common sense questions that drove us to philosophy: how to think better, how to live more fully, how to experience more deeply, how to think more truly and honestly, etc." This happens to literature scholars, too, and is exactly why I decided not to purse a PhD in American Lit. Thanks for the "piropos" as they say in Spanish. I fully support your decision NOT to get a PhD. Like all jobs, academia has its positives and negatives, its bullcrap and its awesomeness.